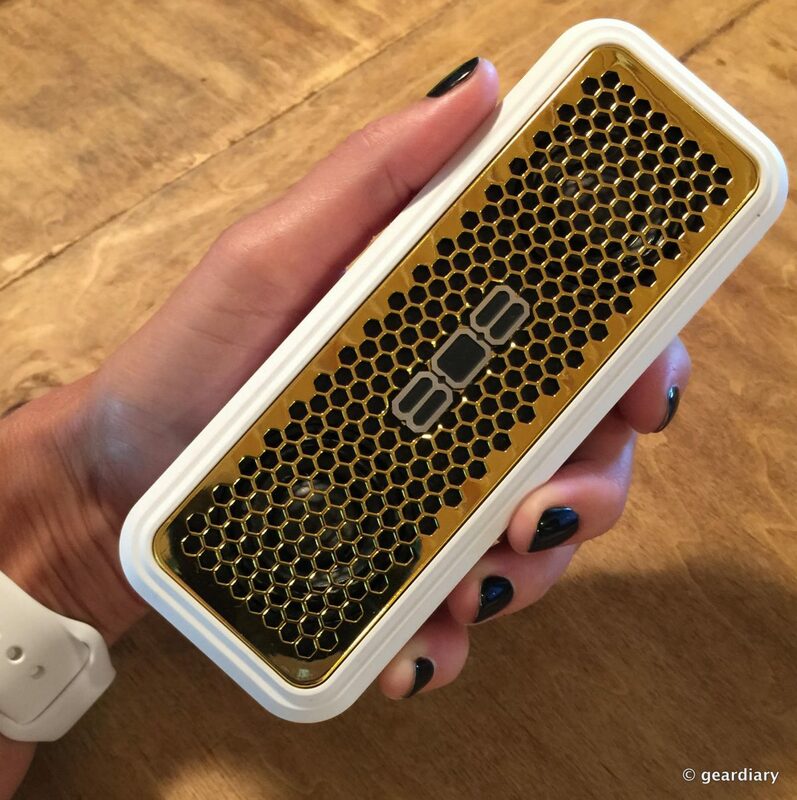 Just about everyone has a portable Bluetooth speaker anymore, right? 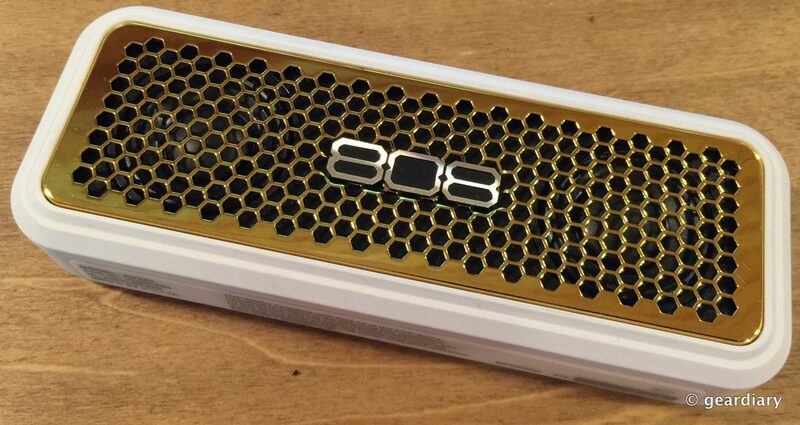 So it takes something special to set one apart from the others, and that’s what 808 Audio is trying to offer with their XS Wireless Stereo Speaker. 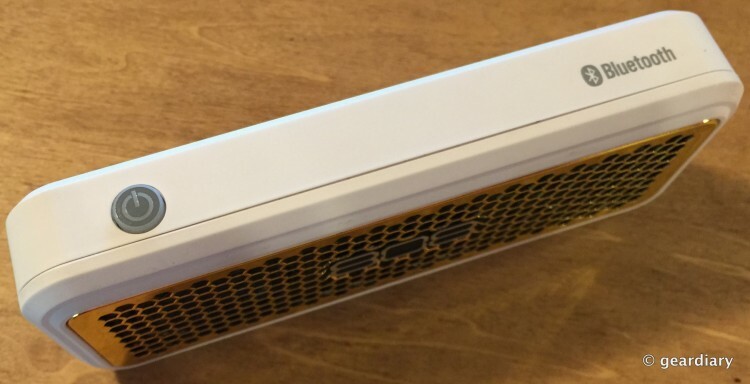 Available in black, blue (with a black grill), or white (with a gold grill), the ~$60 speaker packs a lot of sound in a super portable package. The package includes a standard microUSB charging cable and an auxiliary cable so that you can tether it to a non-Bluetooth audio source, such as an iPod or other MP3 player. I was sent the white and gold XS, which is composed of a white rubber coated plastic and a shiny gold plastic speaker grill. The XS is just a smidge over 6″ long x 2.25″ wide x 1″ thick, and it weighs 7.7 ounces; in other words, it is extremely portable. There is one button on the top edge which handles pairing and power; getting set up is a simple matter of pressing the button until a tone plays and the power button starts blinking blue; select 808 Hex XS on your mobile device, wait for the confirmation tone, and you’re up and running. Volume is controlled solely from your mobile device. On the bottom edge there’s a microUSB port, an LED charging indicator light (glows red when charging and turns off when charging is complete), and the aux in port. Under the front grill you can see the twin speakers. Does it? Sort of! Bear in mind that this is a $60 speaker, so you can’t (and I didn’t) go into this expecting to hear the same sound that would come from a higher-end speaker system. With that said, the XS can get loud, and it sounds pretty darn good for most pop, alternative, and modern rock songs. Listening to a wide variety of artists and musical genres, I found that in most cases the music sounded surprisingly good to be coming from such a small speaker — as long as the song wasn’t bass-heavy EDM or rap. Treble was excellent and clear, and bass was sufficient — but it could bottom out on on bass-intensive songs. Songs that tend to have a muddy mid-range anyway (hello, 90s grunge) weren’t done any favors; they still sounded muddy. Long story short, the 808 Audio XS is not a bad choice if you don’t have a lot of money to spend, and you want a pocketable speaker that sounds and looks better than its price tag implies. 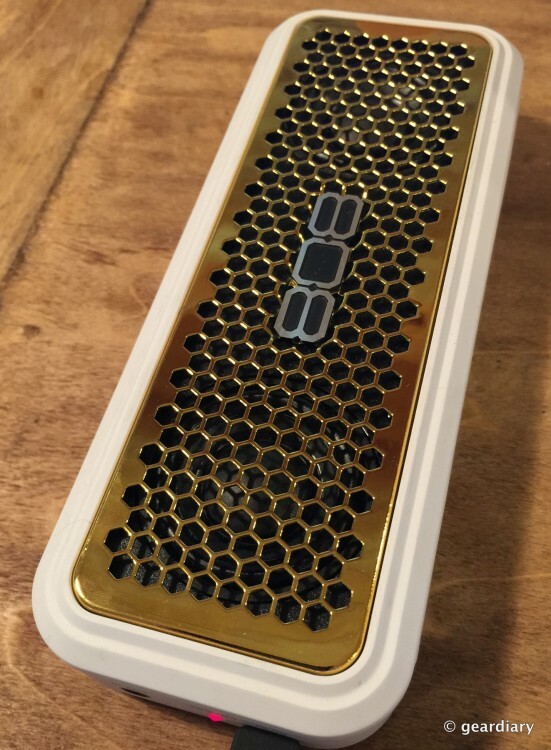 The 808 Audio XS Wireless Stereo Speaker retails for $59.99, and it is available in black, blue (with black grill), or white (with gold grill) directly from the manufacturer and from other retailers.